I'm feeling low, lower than low, actually. I'm throwing a pity party for myself. I've had Leslie Gores' "It's My Party (And I'll Cry if I Want to)" stuck in my head since leaving the doctor yesterday. Funny how that works. Pam and I had a lot of catching up to do so she took me to supper last night. That helped make me feel better because she has similar problems. Here are two middle-aged ladies comparing knee problems over burgers at Red Robin. That's comical in its own right. It lifts my sagging spirits somewhat and then I have to get out of her car and climb the steps into my home. Yes. This is why I'm depressed, when it takes me twice as long to get into my house as it did in February when there was all that snow. There had been, in the mail on Tuesday, an envelope addressed to me, no return address and a Chicago postmark. I've seen this before as in an anonymous benefactor sending a Target gift card. But, I have been doing okay for myself, although my math skills this month left something to be desired. The computer calculator is correct but if you punch in the wrong numbers, you're not going to get the most accurate result. Another thing to depress me. I didn't open the envelope right away. I had to make supper, a new manicotti recipe that, while fast to assemble is below average in taste. It did make a lot so I will have suppers and lunch for the next couple of days. I think the addition of garlic will make it better, but I am not saving this recipe. It's a dud. Once the manicotti was cooking, I sat down and opened the envelope. I was expecting an invitation to something as the envelope is that size. I couldn't think what I'd be invited to, but maybe it would be something I'd consider attending. 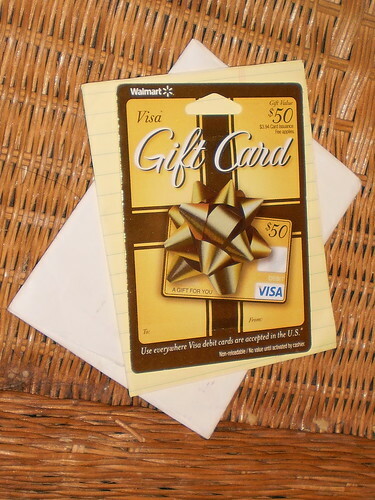 Inside was the usual yellow legal paper carefully enclosing a $50 Visa gift card. I am humbled by this generosity. It's been a rough month but I have survived. I was worried about getting the next batch of medication and here arrives the means to get it. My friend, Patt, recommended a knee pillow she says you can get at the pharmacy which will keep your knees apart. If it's not too expensive, it's worth a shot, to see if it will help me fall asleep and stay asleep. Mija would probably appreciate not being kicked or crushed when I toss and turn. It's uncanny to me how whomever this is seems to know right when I could use this. I sat in the recliner on Tuesday evening, turning it over in my hands just grateful for this person. I used to want to know who they were but I've decided I don't need to. I could not give them any kind of reciprocation in kind and I think the giving is, for them, the best part. My hope is that if my ship ever comes in, I can do for someone else what they have done for me. I decided that I needed to do for me today, something to lift my spirits. I hobbled over to the grocery at lunch and got myself a salad. I have 1 apple and 2 potatoes at home. The potatoes are destined for a corn, bacon and potato chowder recipe I found. It's to rain all weekend. This is the perfect time for soup. The apple will be added to oatmeal apple cinnamon muffins once I get all the dishes finished from the weekend. I just can't do everything in one fell swoop. I have to do some and do another bit the next day. I can't stand and this, of course, depresses me. 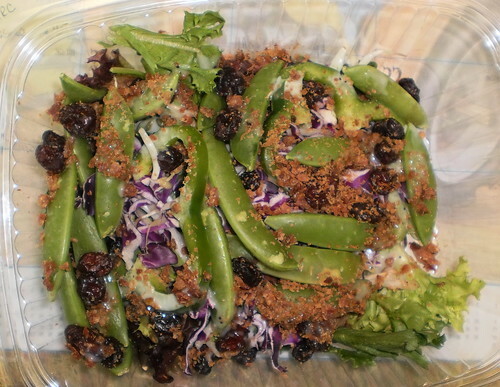 I felt a salad off the Dominicks salad bar would be healthy and would lift my spirits. I also got a couple bagels and a box of cereal since there is one serving of Cheerios left. Yes, there were impulse purchases. I got apple cider. Perhaps that is better for me than a 2 liter of Dr Pepper. It's going to make the house smell better, that's for sure. Drat. I don't have an orange to make mulled cider. No matter. Warmed cider in the microwave will be just as lovely. And, to feed the depression, I got a bag of chocolate Oreos. No finger wagging at me. I'm female. I'm depressed. Eating is what makes it sort of better. Best use of a gift card? Well, maybe not the Oreos but the salad has cheered me up a bit and the idea that I have cereal for next week is another cheer. I'm looking forward to warm apple cider this weekend. Thank you whomever is doing this or to the maybe more than one person who bestows this blessing on me. Your kindness cheers me as I try to shake off this weight that is depression. I am ever so grateful to you. Why Does it Always Have to Rain?